The Terriers will complete their home-and-home series with New Hampshire Monday afternoon at Agganis Arena, after Saturday’s storm forced a postponement. At its original day and time, the game was scheduled to be aired on NESN; however, the rescheduled contest will now be available on Terrier Television (subscription). ► Jack Parker's #6 will be officially retired during the Feb. 28 Senior Night game vs. Northeastern at Agganis Arena. Puck drop has been changed to 7 p.m. and NESN will air the game live. With a pair of assists in Team USA’s three preliminary round wins, former Terrier captain and All-American Kevin Shattenkirk leads the squad’s d-corps in scoring. He says his best moment in hockey was winning a national championship in college. He says this even trumped making it to the NHL "because of the feeling I had with my teammates after the victory which has not been matched yet". In his Olympic bio, the New Rochelle, N.Y., native says his best moment in hockey was winning a national championship in college. He says this even trumped making it to the NHL "because of the feeling I had with my teammates after the victory, which has not been matched yet". 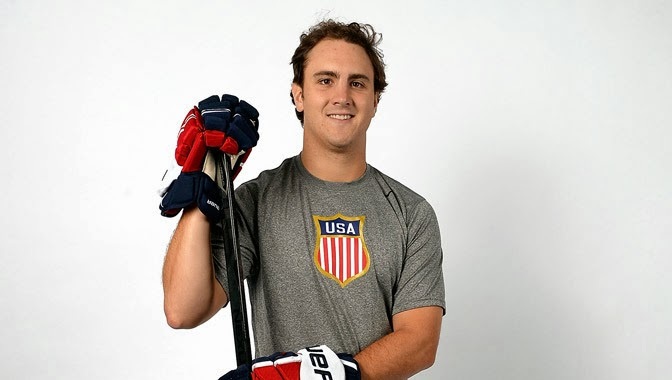 This is the fourth time Shattenkirk has worn the Team USA colors. He won silver in the 2007 World U18 championships and also played in the 2009 World Junior Championships and the 2011 Men’s World Championships. At BU he became the first junior captain in 2009 since fellow Olympian Jack O'Callahan in the 1977/78 season. He is the 24th Terrier who skated for retired coach Jack Parker to play in the Olympic games and the 32nd Terrier overall. ►United States of Hockey review of Team USA in the preliminary round. Team USA next plays either Slovakia or The Czech Republic. 2015 recruit Maxim Letunov’s slick pass (he's #7 in white) set up the overtime game-winner for Youngstown as the Phantoms edged Des Moines, 4-3. The 6-3 center from Moscow who was ranked #68 in the NHL Central Scouting midterms, has 30 points (14G, 16A) in 43 games in his first USHL season. Teammate and 2014 recruit J.J. Piccinich, ranked #164 by Central Scouting, also contributed an assist, raising his scoring line to 23-20-43, also in 43 games. Goalie Shane Starrett (photo), a 2014 BU recruit, stopped 18 of 19 Philadelphia shots as the Portland Jr. Pirates edged the Flyers, 2-1 in overtime. The 6-5 netminder from Bellingham, Mass., who earned his third consecutive win and eighth since joining the Jr. Pirates, has saved 78 of the last 83 shots he’s faced. 2014 recruit Brandon Hickey assisted on a power play game-winning goal as the Spruce Grove Saints, rolled past Drayton Valley, 4-1. The 6-2 left-shot defenseman from Leduc, Alb., has four goals and 15 assists for the AJHL’s top team. Terriers completed a sweep of Providence this afternoon, edging the Friars, 3-2. Sarah Lefort (photo) scored her best-in-the-nation 29th goal of the season, while captain Louise Warren’s 23rd proved to be the game-winner. 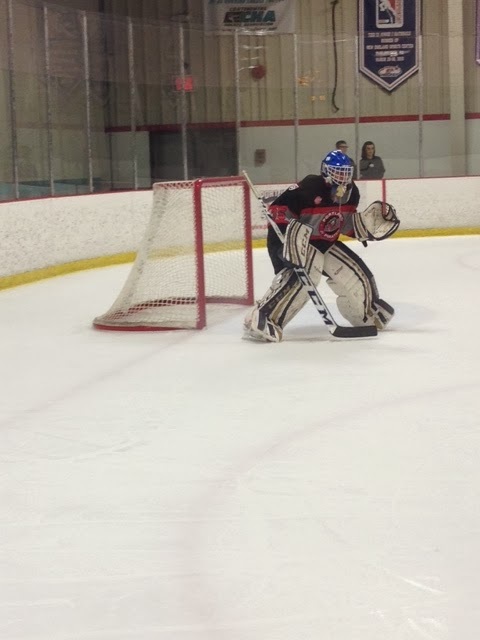 Jordan Juron also found the net for the Terriers. Kerrin Sperry turned aside 39 Providence shots, including 31 in the first two periods. The sweep brings BU’s record to 21-10-1 overall and 14-5-0 in the conference. On Saturday, BU doubled up the Friars by a 4-2 margin at Agganis Arena, with Warren recording her 100th career point with two assists, becoming the 7th skater in program history to do so. Sophomore Rebecca Russo scored the game-winner with eight minutes left in regulation and Taylor Holze added an insurance tally. Freshman Maddie Elia (10th) had scored in the opening period and Lefort (28th) hit the twine the second. ● Post-game comments: Coach Brian Durocher, Russo. Coach Brian Durocher has added another high-scoring forward to BU’s 2014 recruit class. Victoria Bach (photo) of the Mississauga Chiefs leads Ontario’s Provincial Women’s Hockey League in scoring with 34 goals and 31 assists in 32 games. The 5-5 forward from Milton, Ont, also played in Canada’s 2013 National U18 Championships, with a 2-3-5 scoring line in five games, helping Ontario Red win the gold medal. 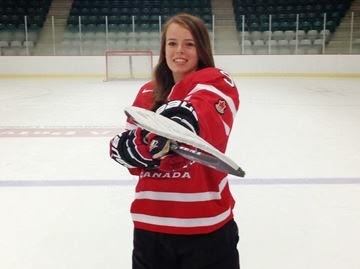 Her five points tied her with fellow 2014 Terrier recruit Rebecca Leslie, who leads the PWHL Ottawa Senators in scoring. She also played for the 2012 gold-medal winning team. Bach’s Mississauga teammate Kelly Mariani, also a member of the 2013 Ontario Red squad, will follow Victoria to BU, arriving in 2015. Today, Bach teamed with Mariani for the game-winner in a 6-3 win against Aurora, with each of the future Terriers recording a goal and two assists. 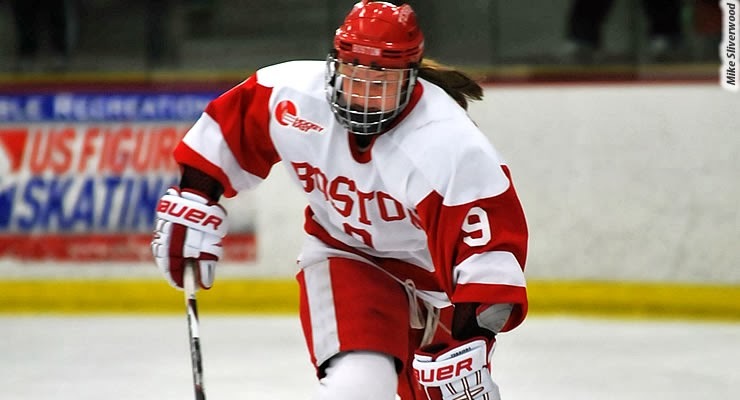 BU’s 2014 recruit class includes two members of the U.S. U18 squad, goalie Erin O’Neill and defenseman Toni Ann Miano.